We're almost at the end of our FIAR studies. What I like about FIAR is that you're brought back to some of the same countries and cities throughout the year. It really helps the student get familiar with some of the places around the world. Here we're back in Venice, Italy, with the story of Papa Piccolo, a Tom cat who takes two abandoned kittens into his care. We learned about cats, nocturnal animals, and The Venice Regatta Parade. We looked at the flag of Venice, the canals and bridges, and some of the boats (barges and gondolas). We discussed fatherhood, orphans and adoption. Since Tom cats like to roam around at dark, there were a few night scenes. The boys tried making their own by drawing backlit windows, to show the effect of light coming from a building at night. Abishai's scene of night-time Venice, with luminescent building and a canal gondola. Since the cat's name was Papa Piccolo, I found a Piccolo concerto for the boys to watch. A book about cats in Italy. We looked at Aesop's fable, "The Fox and the Sour Grapes." This paralleled an element from the story of Papa Piccolo. We made a puzzle flag of Italy. Papa Piccolo named the abandoned kittens Marco and Polo, so we all played the game, Marco Polo. My book on the real Marco Polo was written for a higher grade level, so one quiet evening I enjoyed just reading it to myself. There are so many beautiful colours in the water paintings of Papa Piccolo. 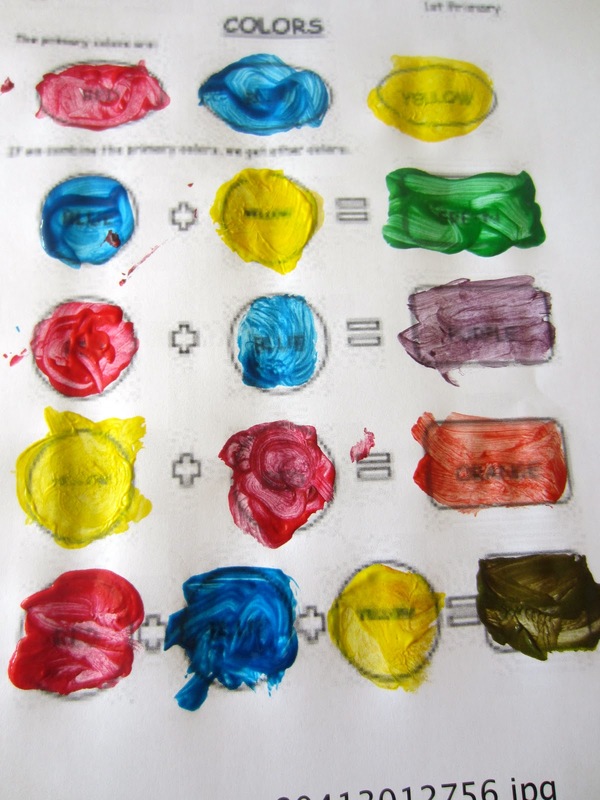 Although we haven't had the chance to buy quality water colour paints, we took the paint we did have, and mixed them to see what colours we could make. I made my own copy to bring out for the boys to look at in future art projects. We had fun exploring Venice again. You can always find something new to learn.